During the 1930s a new type of lighting fixture appeared on the scene using slip-shades. Slip shades are glass shades which “slip” into place. These were the very acme of modernity, and such fixtures became wildly popular. They still are. And are normally quite expensive. I rarely offer slip-shade fixtures. Partly, because they are so popular, and I tend more towards the unusual and even exotic. Also, it is hard to make a profit reselling slip-shade fixtures because they are so pricey. Occasionally though I am able to acquire a slip-shade chandelier or pair of wall sconces. 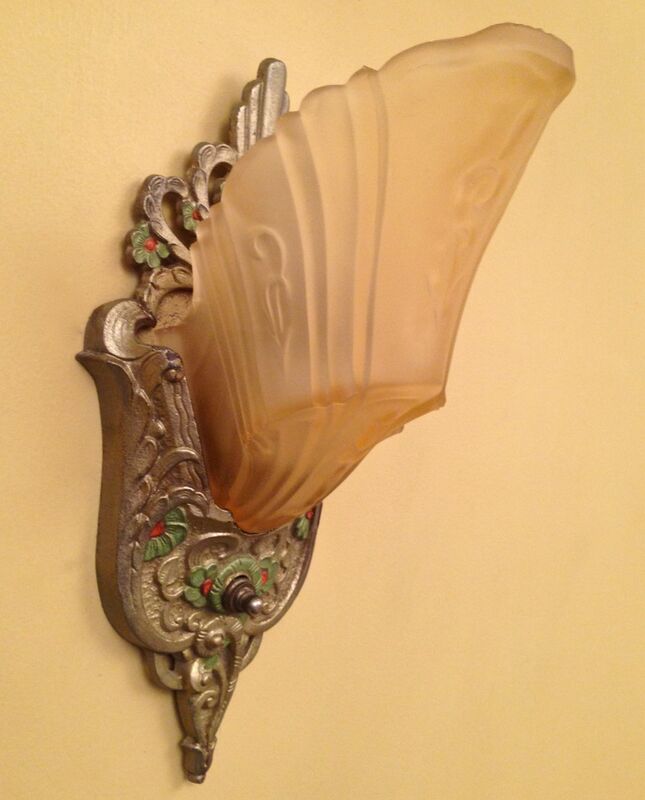 Last year I found a lovely Art Deco pair of sconces online. Whoee! But when they arrived, poor packing had shattered the glass shades. Pooee. Since then, I have daily scoured eBay for a matching set of shades. Imagine my great excitement when, at last, at last, my search was rewarded.